Reid Bigland has a long track record of success. In 2011, CEO Sergio Marchionne tapped him to run the automaker's U.S. sales. DETROIT -- This should have been Reid Bigland’s year. Under his leadership, Fiat Chrysler Automobiles outsold its competitors in Canada for the first time in the carmaker’s history while enjoying an unprecedented streak of rising sales in the United States. The success earned Bigland a promotion to head Fiat Chrysler’s Alfa Romeo and Maserati brands, making him one of Chairman Sergio Marchionne’s most trusted deputies. 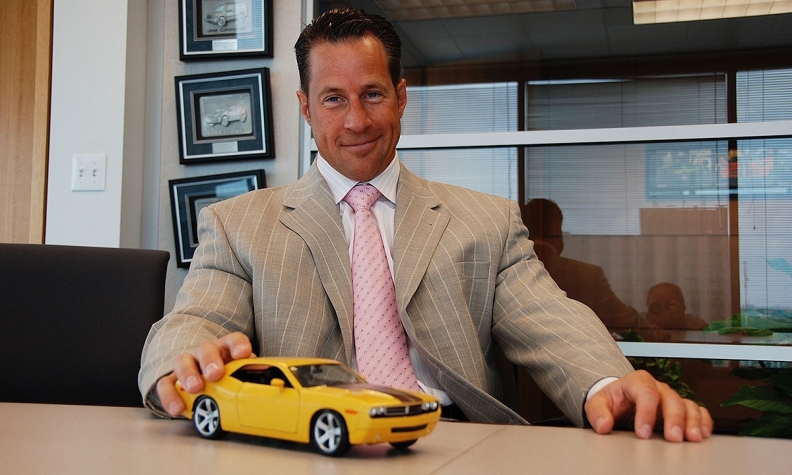 Now, Bigland, the 49-year-old head of U.S. sales and CEO of Fiat Chrysler Canada, is at the center of U.S. criminal and regulatory investigations into whether the company fraudulently hyped its monthly sales numbers, people familiar with the matter told Bloomberg. The probe has implications that may go far beyond Fiat Chrysler, potentially upending the U.S. auto industry’s way of reporting sales, long designed to showcase them in the most positive light possible. For many dealers around the country, it’s just a given that Bigland, a charismatic speaker with chiseled features and a bodybuilder’s frame, pushes hard for results. For them, he’s the tough but fair leader, at once beloved for his cheerleading yet sometimes feared for his ever-escalating demands for higher sales. Automakers have been leaning on dealers for decades to move cars off their lots, a pressure that has long been accepted as part of the business. It’s not just consumer purchasing at issue. Investors also weigh monthly sales reports closely for signs of how auto companies are faring. But now the U.S. government is questioning whether Fiat Chrysler’s tactics have gone too far. Bigland’s signature is displayed on documents filed with the Securities and Exchange Commission containing some of the disputed sales figures. The monthly sales reports often contain statements from Bigland touting monthly results and a streak of continually rising sales that he said went back to 2010. The sales streak was also highlighted in other filings, including Fiat Chrysler’s 2015 annual report. Federal investigators are eager to determine whether documents were falsified and, if so, whether company officials may have known what they were signing. The investigations follow lawsuits filed this year that allege company officials offered money to dealers to falsify sales. The company and Bigland declined, through a spokeswoman, to comment. But in a press conference near Detroit late last month, Marchionne said “we continue to collaborate with authorities. In July, after Bloomberg News and Automotive News reported a criminal investigation was under way, the automaker restated its monthly sales numbers, noting that out of 7.7 million reported deliveries, only 4,500 vehicles over a six-year time span were in question. And it pointed out that quarterly revenues, based on deliveries from plants to dealers, were not affected by the restatement. In Canada, it showed July sales were almost 20 per cent fewer than the old system would have reported. Still, the recalculation shortened the automaker’s previously reported sales-growth streak by three years, ending in 2013 rather than 2016. Fiat Chrysler’s shares fell 4.3 percent the day after it released the revised numbers and an additional 4.8 percent the following day. The news was a blow to investors because Fiat Chrysler has impressed over the years with its steadily rising sales. The automaker’s monthly results, with their drum-like beat of incremental increases, evoke an earlier era when many U.S. companies engineered their earnings to surpass expectations by pennies to please Wall Street. Investigators are examining whether Fiat Chrysler improperly adjusted monthly numbers to show growth over the prior year, a person familiar with the matter said. They are looking into allegations the company ordered dealers to create false vehicle purchases, some of which were made in the names of friends and relatives of salespeople, including underage family members, the person said. The allegations get even stranger. Investigators are probing calls from Fiat Chrysler officials to dealers saying its department of “unnatural acts” was open for business, the person familiar said. The question is whether those calls had any relationship to allegations that company officials were urging dealers to falsify sales to meet reporting targets, the person said. Top-ranking auto executives have rarely, if ever, been personally ensnared in their companies’ scandals. In cases brought against General Motors for ignition problems and Toyota Motor Corp. for uncontrolled acceleration, no high-ranking executives have been charged in the U.S. That may not always be the case. The FCA investigation comes nearly one year after the Justice Department put in place a policy requiring that all corporate cases include a plan to charge individuals, a policy triggered by criticism that they weren’t being held accountable even as the businesses paid billions of dollars in fines. The government criminal probe follows two lawsuits filed against Fiat Chrysler earlier this year. In one of the suits, Ed Napleton, who owns more than 50 dealerships in five states, alleges a Fiat Chrysler district manager in June 2015 offered him $20,000 if one of his dealerships falsely reported 40 vehicles as sold. The money would be credited to the dealership’s account as “cooperative advertising support,” the suit alleged. FCA would then mark those same vehicles as unsold at the beginning of the next month, according to the lawsuit. The practice is known as “unwinding” a sale. Unwinding is a normal practice for returned cars either when customers change their minds about their purchases or fail to get financing. Fiat Chrysler denied Napleton’s allegations, issuing a statement in January claiming an internal investigation found no evidence of wrongdoing. But in July, the company said that “unwound” sales had not been subtracted from later reports. The subsequent revision shortened to 40 months Fiat Chrysler’s previously reported 75-month record streak of monthly sales growth. The two lawsuits also allege Fiat Chrysler manipulated sales with incentive programs. Under Bigland’s leadership, these have been among the most expensive in the industry. Maserati of Long Island sued the company in July alleging other dealers were given cash incentives to count cars in their demo fleets as sold, even though there was no retail buyer at the time the sales were counted. Interviews with dealers around the country show how such tactics work. With a few days left in June, Jackson, Mich., dealer Wes Lutz’s Extreme Chrysler-Dodge-Jeep dealership needed to move 10 more cars to hit headquarters’ goal that month of 78 sales. He was highly motivated by the lure of receiving $900 from the automaker for each sale. But if he missed the target in the so-called stair-step program by even one car, he would forfeit his entire $70,200 payout. To avoid that happening, Lutz turned to another FCA program that allows dealers to count loaner cars as sold vehicles. Not only was Lutz able to reach his target, he says he received $5,500 per car for placing 10 in his loaner fleet. Those models were then accounted for as sold. Lutz later sold them as used vehicles. But Walser thinks incentives programs have gotten out of hand. Bigland has a long track record of success. In 2011, Marchionne tapped him to run the automaker’s United States sales. By then Bigland had already overseen the growth of Canadian market share, which has increased 41 percent since Chrysler’s 2009 bankruptcy, putting the company within striking distance of Ford Motor Co. there. After Marchionne put him in charge of U.S. sales, Bigland went on to show what were believed to be 60 straight months of growth before the company revised the streak down in the wake of the Justice investigation. “He has a record of top-level business performance in every job he’s ever had,” said Tom LaSorda, the now-retired CEO of Chrysler LLC. “Reid does drive people to deliver numbers.